If you found a project particularly inspiring please email me. I took an old luggage pocket, and mounted it on a chippy old board. Then I embellished it with different architectural and hardware items. I even add old jewelry, keys or whatever I can find. 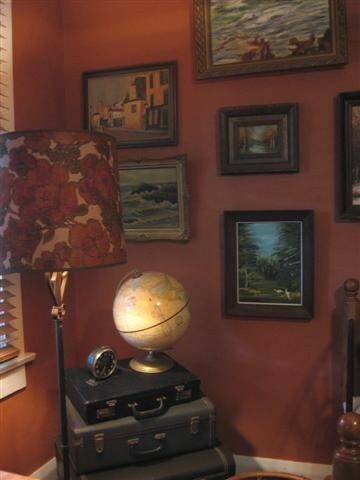 Items similar to this are available in My Store This works great to display photo's, cards, mail etc. AJ Explains how this Suit Case Table was made "We adhered two sections of 2x4 to the inside bottom of the suitcase (front to back) Once dry, I drilled my holes for the legs, through the outside of the suitcase into the 2x4's. ( the legs were old used ones of course!) 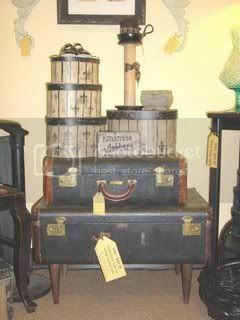 "
Old Luggage as a Planter or seasonal display This pic came from the Junkwarehouse Be sure to visit their site for more great ideas. I finally got my own luggage, found some great deals. Fill a small piece of luggage with spa items for guests. This will make them feel very welcome. DaciaB (below) uses old suit cases to organize her craft room. she says "The hardest for me was setting up a workable system for the way I work... 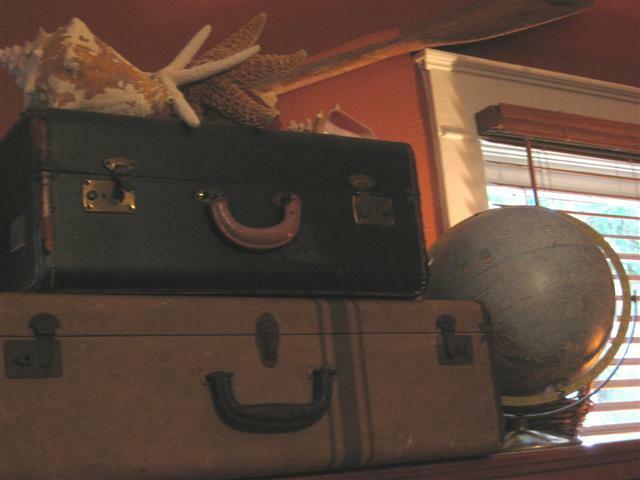 I used antique suitcases. I have one 'category' in each suitcase, I have pressing equipment, handbag patterns and notions, fabric to make baby stuff, fashion patterns, home dec patterns, and batting. You can see the white rectangles at the back (these are my labels)"